Metal catch with plastic rollers and prong. 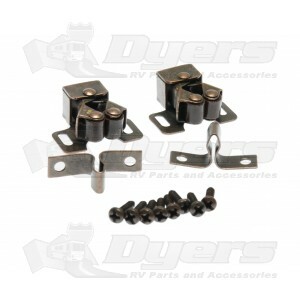 Catch: 1-5/16" L x 1-1/16" W x 1/2" H.
- Mounting holes are spaced 1" apart and are 3/8" slots. Prong: 1-5/16" L x 3/8" W x 5/8" H.
- Mounting holes are spaced 1" apart.